While you wish it to be different, the infertility process can quickly take over and become your “new normal.” As I underwent treatment, I remember questioning who I was becoming and changing into as a result of my infertility. I had many thoughts that I wasn’t proud of, and I was too scared to admit my guilty thoughts to anyone. But one day, I finally stepped out of my comfort zone and confided in my cousin, who at the time was the closest person to me who also had gone through infertility. I spilled everything: how laser-focused I was on getting pregnant, how quick I was to judge my worth against other pregnant women, how stressed I was, etc... And worst of all – I was lonely and sure that no one could understand how I felt. "And then she said the three words I needed to hear most: 'Yes, it’s normal.'" A wave of relief washed over me. Some say they never had a problem finding happiness for their pregnant friends, or they never struggled with judgmental feelings, but personally I experienced the exact opposite. It seemed like every time I opened my mailbox, I would receive a flood of baby shower invitations. Every time I walked into Target, I felt my heart sink as I walked past the baby section, loaded with racks of cute, tiny clothes, plush toys, and lavender-scented baby wipes. Do any of these situations describe you, too? 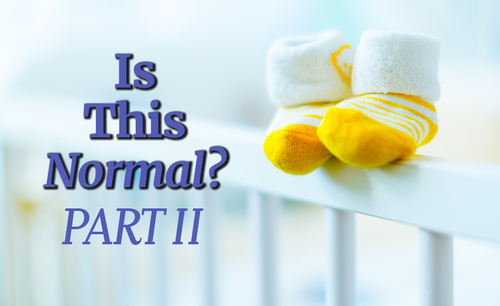 In this new 3-part blog series titled, “Is This Normal?” I want to dive into the deepest and truest feelings of a woman undergoing fertility treatment. Beginning right now, I want to walk with you on your journey, and let you know that yes, it’s normal. I will never forget the day when one of my new “infertile friends” asked me to go for a walk with her. I was so excited I met someone who I could share my feelings with about infertility. Our new friendship grew as we bonded over our struggles with conceiving, which helped to defeat the loneliness that infertility had brought to my life. One day she asked me if I would like to go for a walk with her. I thought she needed to talk about her feelings and the sadness she was experiencing due to being told by her doctor that she would probably never conceive. It was the complete opposite; she needed to share with me that she was pregnant. "I held my breath for what felt like forever." In the coming months, seeing my friend’s baby belly pictures was hard. Just when I had one of those rare days where I wasn’t completely wrapped up in thoughts of my own infertility, I would see her cheerful smile as she cradled her growing belly. So long to a “clear mind” and hello to the familiar feeling of a broken and defeated heart. I wanted to be so happy for her, but I couldn't help but feel the loneliness flood back into my body. I found myself alone again in my despair with being infertile. I am not proud of how I felt, but my heart was so broken and I felt so hopeless that I couldn't muster up genuine happiness when hearing about a new pregnancy. And it wasn’t just hopelessness that I struggled with – I found myself overwhelmed with jealousy every time I saw any pregnant woman. Mixing all this jealousy and sadness of not being pregnant was definitely a recipe for a mental breakdown. "But ladies, say it with me: 'It is normal.'" It is normal to struggle to be happy for someone when you find out they’re pregnant, while you’re suffering from infertility. Yes, you may feel guilty for feeling this way, but it’s not easy to see a constant reminder of something that you want so badly. You may even find yourself removing your friend’s updates from your weekly feed just to cope. Either way you look at this, it’s very important to dig down deep and try your best to recognize the importance of being there for your friend and sharing her excitement. I am not saying this is easy, but finding a good friend is also not easy. A good friend is hard to find, so when you find one, hang onto her. A good friend will always be there for you, and while it may not be your struggle with infertility that she can help you with, life is inevitably full of various challenges, and one of the best ways to overcome these hard moments is through quality time with and support from a great friend. Note from Donor Egg Bank: Even more than traditional IVF, we find that women who have used, or have been encouraged to use donor eggs struggle with feelings of loneliness and defeat. If you need encouragement, inspiration, or want to learn more about the donor egg process from women who’ve already “walked the walk”, contact us at (855) 344-2265 or at info@donoreggbankusa.com to join our private Facebook sisterhood group. Life works in funny ways; sometimes your closest loved ones are the very ones who cause you the most unrest about your infertility. But let’s revisit what we learned from Part I of this series: infertility is a tender subject, and many struggle with mixed emotions about how to communicate to someone walking that path. And this is normal for everyone involved. In the same way you might find it hard to be happy for your pregnant sister, she might find it hard to be open about her pregnancy around you. "Infertility is a tender subject, and many struggle with mixed emotions about how to communicate to someone walking that path." With this said, infertility can bring about feelings you’ve never experienced before, but with all your might, don’t let it change the kind of sister, daughter, or friend you are. Your friends and family should want to be there for you, so be sure to let them, and recognize that while they may not be able to understand what you’re going through, they can provide you with the care, love, laughter, smiles and fun that you need to get through the daily struggles. Now you may be reading this and thinking to yourself, “That sounds nice, but I’m just not there, yet... I’m not ready to let people in my bubble.” And that’s ok – in fact, it’s normal! You’re enduring arduous medical procedures, rearranging your schedule to drive to the clinic several times a week for routine ultrasounds, and setting multiple alarms on your phone to keep track of all your medications by the hour. Your proverbial bubble is about to pop, and being social isn’t quite at the top of your to-do list as it once was. "No matter how much space you need, it’s important that you don’t completely isolate yourself from others, too." Another funny thing about life is that sometimes you never know why you’re placed in certain situations, especially while treading through so much grief, until one fateful day the reason is revealed to you. While at one point in time no one close to me had gone through infertility, it wasn’t long before pregnancy loss consumed my inner circle of friends. With every new unsuccessful cycle that occurred among us, my eyes opened more and more as to why I went through infertility first. I had already walked in their shoes; I could relate to their situation and be a system of support and – call me crazy – I felt privileged to be this for my friends. I was chosen first so I could ensure my friends didn’t have to go through the same experience without receiving love and encouragement from someone who already endured it. "Lend a hand and a listening ear to others, and give your loved ones a chance to be there for you." Helping other women like myself proved to be cathartic for me, too. It felt like a synergy was awakened between me and others like me, just by sparking up a conversation about our walks with infertility. So my advice to you: lend a hand and a listening ear to others, and give your loved ones a chance to be there for you. I have the most incredible girlfriends in the world, and while at the time they couldn’t understand what I was going through, they indeed got me through it. Without their arms wrapped around me so tightly, providing me with hope and encouragement every step of the way, I know my walk with infertility would have been ten times harder. And when they began to experience it for themselves, I was ready and prepared to give all that love back. PART III: Who is the woman behind the mask? Your superpower may be the ability to appear like everything’s under control, but inside you’re probably a wreck. While dealing with infertility, every day is just another fight for normalcy. Here’s an example: It’s Friday night, and you treat yourself to a girls’ night out because you need a little fun in your life. You see all your girlfriends enjoying wine with their dinner, and you quickly remember that you probably shouldn’t indulge with them as your infertility paperwork tells you to avoid or at best minimize your intake of alcohol. You would never want to do anything that would decrease your chance of becoming pregnant, so you ask the waiter for a glass of sparkling water with lemon served in a wine glass. I mean, at least you can feel like you’re part of the crowd. It’s all about the glass right? What’s worse is that if you were pregnant this wouldn’t be an issue at all. In fact, you would be rejoicing that you weren’t able to have a glass of wine, because you had a sweet little miracle growing inside of you. Yes – this is just one of many examples of the small life adjustments you make while dealing with infertility that shortly become burdensome reminders that you’re still not pregnant. And there are so many other changes that may happen to you during this time. Once you begin infertility treatments, your life and schedule become completely dictated by the timing of your injections, pills and multiple doctors’ appointments. Not only do you have a massive amount of hormones raging through your body, causing you to think and act out of sorts, but you also have several restrictions of what you can and can’t do. You start to notice your jeans aren’t fitting as well as they used to, and you’re constantly hungry. Before you know it, you have your own “infertility treatment” wardrobe equipped with loose flowing shirts, comfortable dresses and elastic waistband shorts and pants. You know it isn’t an appropriate time to go on a diet so all you can do is blame those infertility medications for the creeping weight gain! You need a little pick-me-up to get your day started, so decaf has become your new best friend; the only boost you’re really getting is being led by your imagination pretending that there is caffeine in your coffee. Every day you put on your superhero costume to hide your pain. Your mask may be smiling when you really don’t want to, or your costume may have an ‘S’ on the chest even though you feel anything but powerful. Maybe if you act like everything is under control, people won’t say things like, “Just relax and stop stressing. You’ll get pregnant someday.” How can anyone expect you to relax and stop stressing when you’re fighting for your dream; when you’re enduring arduous medical procedures and repeated heartache and disappointment month after month? It’s ok. All these thoughts and feelings are absolutely normal. The mask may get you through life’s daily struggles, but do not be ashamed of the woman underneath. She is the true fighter. She is conquering one of the hardest obstacles that a woman could experience. Be proud of your perseverance; be proud of the warrior you’ve become; and be proud that you’re not giving up on achieving your dream! Note from the author: With the conclusion of my "Is This Normal?" series, I wanted to inspire and speak to women who, like myself, have "walked the walk" of infertility. Thank you for being a part of my journey, and if you should feel comfortable, feel free to share your story below. Want more inspirational egg donor stories? Read our client testimonials here! Melissa Butcher was a professor, recently promoted to a full-time stay at home mom. She enjoys life with her husband, two miracle children and two four-legged companions. She spends her days joyfully being a helicopter mom who loves snuggling and playing with her two mini tornados and using her teaching background to "play school," growing two future bookworms! Thank you. Needed to hear this. I've been on this journey for over two years now and it has left me wounded and saddened. I am hoping for a breakthrough, but always wondering whether one will ever come. Your article was very helpful . I never stop thinking about getting pregnant, being pregnant, & IVF. Searching for PGS tested female embryo(s) & any possible sites to search would be helpful. Fertility doc says his oldest Pt. was 57 yo. I'm 51 yo & goal is to have two pregs.